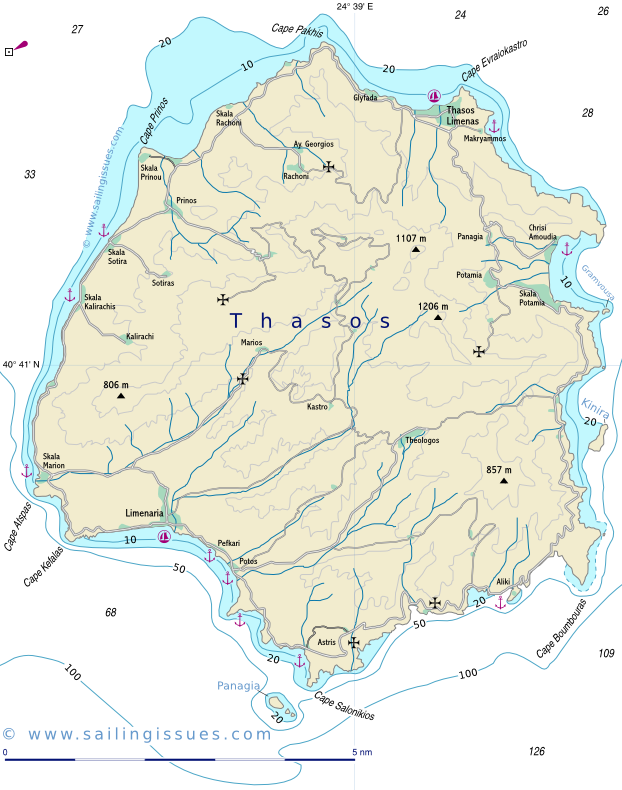 The island of Thasos - Θάσος in the northern Aegean (Sea of Thrace) is well-watered and lush. It lies far away from the yacht charter bases although Kavala or Thessaloniki can sometimes be used to rent a yacht. 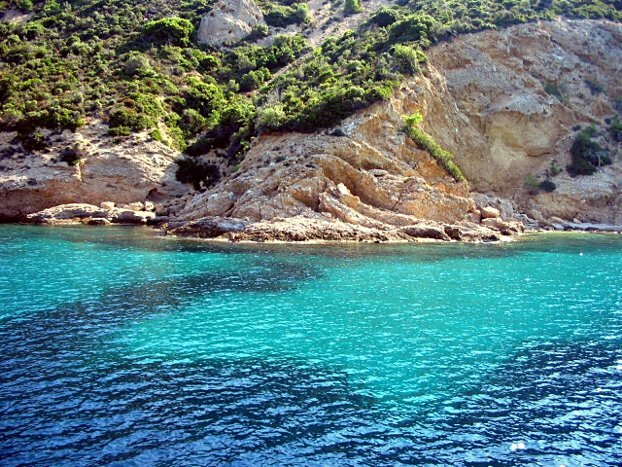 Yet, most sailors will visit this gem from Skiathos (Northern Sporades) when on a two or three week itinerary. The island is occupied by a range of wooded hills rising to 1206 metres and slashed by deep valleys. The northern and eastern slopes fall steeply down to the sea; on the south and west sides the hills slope down more gradually, forming numerous deep sandy bays, anchorages and ports along the coasts. The island's income comes from farming, mining (copper, zinc) and increasingly from the tourist trade. The island's capital and port, Thasos or Limenas, occupies the western half of ancient Thasos, the greatness of which is evidenced by the imposing walls round the ancient naval harbour (now the fishing port), stretches of town walls (7th-5th c. BCE), originally 3515 metres long, and the foundations of houses and temples, which extend in a semicircle, rising south-eastward from the shore up the slopes of the ancient acropolis, now crowned by a ruined medieval castle, the kastro (1431). At the south-western end of the castle can be seen an ancient relief of a funeral banquet. Ports of Thasos looking east. To the left the theatre and bottom right the submerged ancient breakwater. By the north gate, south-east of the ancient naval harbour, are the Museum, with a fine collection of Greek and Roman finds, and the Agora (4th c. BCE), with a stoa and the Sanctuary of Artemis (6th c. BCE). At the south corner of the Agora are the Odeion (2nd c. BCE) and, beyond the Roman road, a paved courtyard. Farther south-west a Temple of Herakles (6th c. BCE). In the northern part of the ancient city are temples of Poseidon and Dionysos (both 4th c. BCE), the theatre (3rd-2nd c. BCE), a sanctuary dedicated to foreign divinities and a Sanctuary of the Patrooi Theoi (6th c. BCE). While in the sea there are the remains of a breakwater from the ancient port (sometimes marked with a buoy). Finally, south-west of the Kastro are the foundations of a Temple of Athena (5th c. BCE) and a Sanctuary of Pan. 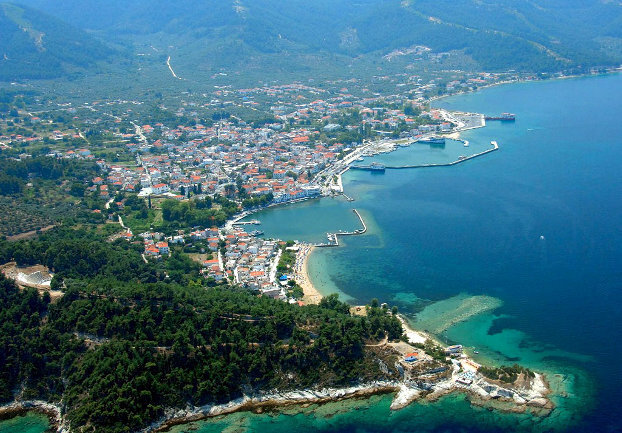 The pristine surroundings and abundance of archaeological sites make Thasos an absolute must-see on sailing holidays in the northern Aegean, and well worth sailing the extra distance from the Skiathos or Athens yacht charters bases (Alimos). The town's atmosphere truly helps imagining how life was in antiquity. The earliest traces of human settlement date from the Late Neolithic era. About the middle of the 2nd millennium BCE Phoenicians settled on the island, later displaced by Thracians. In the 7th c. BCE Ionian Greeks from Paros captured Thasos from the Thracians and thereafter grew prosperous through gold- and silver-mining and trade. Between 464 and 404 BCE the island was occupied, after fierce resistance, by Athens, and later became subject to Philip II of Macedon. 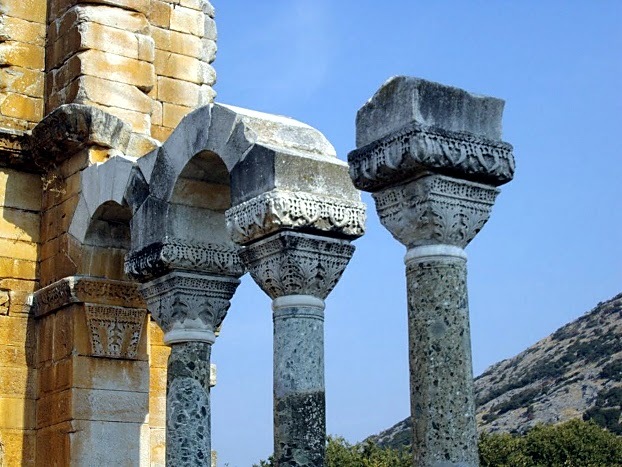 The Agora of Philipi, Justinian capitals of the Basilica. After periods of Roman, Byzantine, Venetian and Bulgarian rule Thasos was occupied by the Turks in 1455. Between 1841 and 1902 it was an appanage and perquisite of the Khedive of Eqypte, granted by Sultan Mahmud. It was occupied by Greek forces in 1912, during the Balkan War.